If your child is underweight, it may be tempting to give them high-energy (high-kilojoule) foods such as sweets, cakes, chocolate and sugary drinks. These foods may help them gain a little weight but they will not provide the nutrients your child needs to build strong bones and a healthy body. lean meats, chicken, seafood, eggs, legumes (cooked dried beans, split peas and lentils), nuts and seeds. For more information about the four food groups and how many servings your child should have every day see the Ministry of Health's document Eating for healthy children aged 2 to 12 (Ngā kai tōtika mō te hunga kōhungahunga). If your child is eating a variety of foods but they are not gaining weight, they may need extra energy and nutrients such as protein and fat. For tips to boost your child's energy and nutrient intake see High energy eating for children from the Sydney Children's Hospitals Network. Sometimes children who are fussy eaters may not eat enough food. If this happens regularly, they may lose weight or not gain weight as they should. For information about fussy eating and tips for creating positive, normal, healthy eating patterns see Fussy eaters. 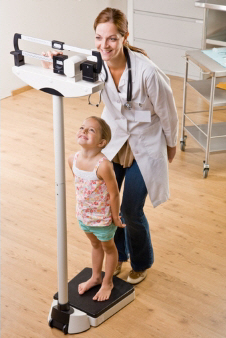 If you are concerned about your child's weight, make an appointment to see your doctor or practice nurse. They will check your child for any underlying health issues. They will also weigh and measure your child and talk to you about what your child is eating. If your child is not getting enough energy (kilojoules) or nutrients such as protein, your doctor or nurse will give you advice or refer you to a dietitian. Written by HealthInfo clinical advisers. Last reviewed October 2016.